On your visit to Hungary, plan to dine on the local food. Rich and flavorful, it's available on the street, in markets, and in restaurants. Below find some of the tastiest specialties and recommended restaurants for couples with a love of food and adventure. A popular restaurant that serves traditional Hungarian food on the Pest side of Budapest, the informal Cafe Kor has an old-world air. This casual bistro has outdoor seating and is located around the corner from St. Stephen’s Basilica. 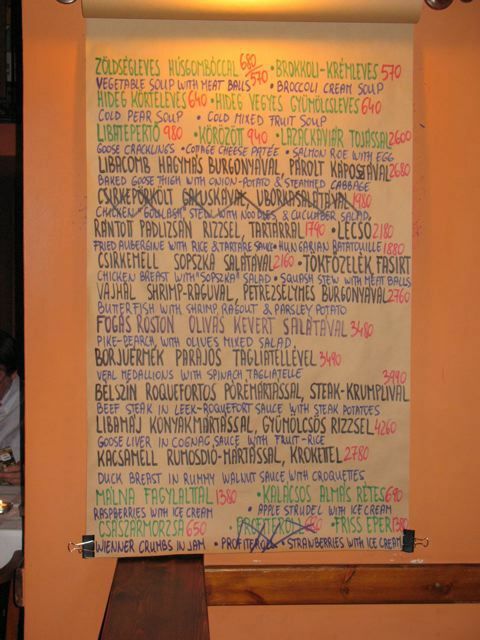 Hungarian specialties served include goose cracklings, foie gras, and pike perch. Click on the image to get a larger and more readable menu. Find out more about Cafe Kor. As delicious as they are artery-hardening, crisp fried goose skin is one of the appetizers available at Cafe Kor. Fried goose skin is a crispy explosion of flavor served with cucumbers, tomatoes, sliced onions, and bell peppers to help you feel someone virtuous about and mitigate the effects of the the high-fat treat. Pike Perch is a freshwater fish popular in Hungary. Rich and sweet, Hungarian desserts offer a number of ways to finish a meal. In Budapest as in every major city, affordable street food is available where people gather. On the Pest side, this is one of Budapest's pedestrian streets lined with sidewalk cafes. Coffee and cake in a café at the end of a day is more than coffee and cake. Don’t miss the multi-layered dobosh cake topped with apricot jam. The cafe is located around the corner from the Four Seasons Gresham Palace Budapest and a block from St. Stephens Cathedral. On a small, man-made island adjacent to Budapest's City Park, Robinson's offers guests romantic waterside tables. More delectable for its setting than its fare, Robinson's serves casual Hungarian fare. Kollazs, the Four Seasons Gresham Palace Budapest's all-purpose restaurant, serves breakfast, lunch, afternoon tea, and dinner. Located in Budapest's Castle District high atop the city, Karmelita Udvar is one of the city's newer, more modern restaurants. Be sure to stroll around the grounds that once housed a Carmelite nunnery to take in the bountiful vies of beautiful Budapest. To get a sense of the Hungarian people and their cuisine, pay a visit to the Great Market Hall, in operation since the early 1900s. The largest and oldest indoor market in Budapest, this is the place to shop for paprika (hot or sweet? buy both!). The ground floor also sells meats, cheese, vegetables and irresistible pastries. Don't miss the third floor, where you can not only dine on authentic cuisine but shop for the widest array of souvenirs available anywhere in the country (including the airport). You'll find hand-embroidered garments, handsomely carved bowls and other well-crafted items among the kitsch and trinkets sure to catch your eye. The national spice, paprika is available in both sweet and spicy versions. Hungarian cooks use it to flavor chicken paprikas and goulash soup. One of the best (i.e. lightest and cheapest) souvenir gifts you can buy to bring home is paprika, sold in all sizes and in pretty containers. Just know whether you want sweet (regular) or spicy (hot). Held outdoors in Budapest's Castle District, the International Wine and Champagne Festival gives visitors the opportunity to sample different wines. Attendees get a wine glass with admission and tickets to exchange for samples. As the night wears on, the popular festival gets busy. So couples are advised to come early and visit during the week, rather than the weekend, if possible.